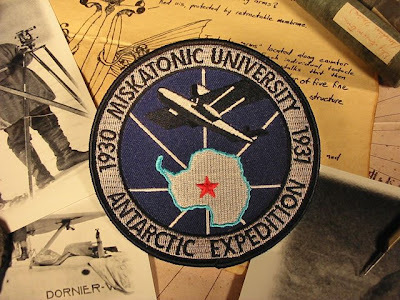 Those questions may never be answered, but now you can own a small piece of that ill-fated expedition's history: the famed "Wings Over Antarctica" Miskatonic University Expedition Patch. This is a limited-run fan project based on H. P. Lovecraft's classic horror story "At the Mountains of Madness". Based on feedback from the first run of patches the design was tweaked to bring it more in-line with what a period patch would actually look like, including the use of a contemporary font. 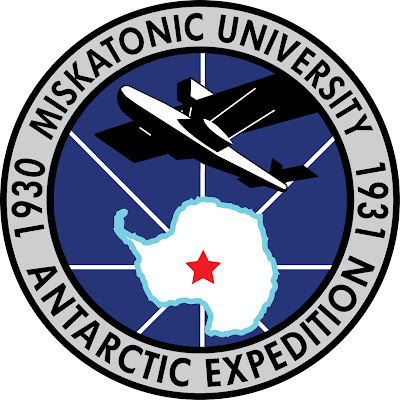 The deco-influenced logo features a stylized depiction of Antarctica surmounted by the Dornier Wal amphibious aircraft that was flown to the Mountains of Madness...and beyond. Each 4" (10cm) patch is embroidered on a tough cotton twill backing that will last for years of use, and the heat-sensitive adhesive makes it easy to iron it on to the garment of your choice. With each patch purchase you'll also receive a 3" vinyl decal featuring the expedition logo, perfect for customizing your gear. Your order will be sent out in a protective mailer within, at most, 24 hours of your purchase via First Class mail. You'll receive email confirmation that your package was shipped within minutes of it's posting. U.S. orders should arrive within five business days, while international orders will likely take longer. If you're purchasing multiple patches you'll find there is a discount on every patch after the first. If you would like to order more than three patches even more significant discounts are available. If you have any questions, or encounter any problems, please don't hesitate to email me at propnomicon-atsymbolhere-gmail.com. Update: Sold out as of 4/24/2009. Thanks to everyone that ordered. 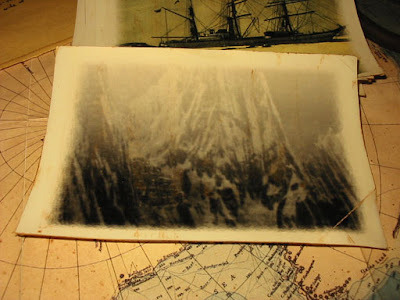 You might also be interested in the "At the Mountains of Madness" Prop Photo Set. A kind emailer sent me a message pointing out that the "Curious Goods" site seems to be down. Hopefully it's only a temporary glitch. The Box's Dimensions are 10 3/4"x 7 3/4" x 8 3/4"
This particular kit is from "Ickyfish", a seller who has offered items I've enjoyed in the past. Some of the features I like about this piece are the excellent design and aging on the bottle labels, the velvet lining inside the case, and the sculpting and overall quality of the "thing in a bottle". I think the asking price is a little high, but I'm from the "start low and see where it goes" school of Ebay auctions. 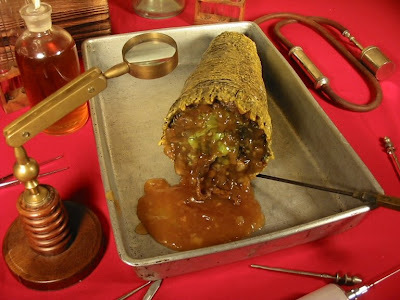 I'm particularly proud of the loathsome ichor leaking from the slowly thawing eye stalk. I whipped it together from some cornstarch, water, and instant tea. Yes, that's right- it's basically lumpy gravy. We're on the cutting edge of special effects here at Manse Propnomicon. Heh. If you're running a Delta Green game and need some modern paperwork from the FBI you should pay a visit to Prop Docs,a company that specializes in manufacturing documents for motion pictures and television. They've posted some examples of their work on their webpage that cover nearly every imaginable bit of paperwork you might need. The PDF's aren't intended for use as-is (since making documents is, you know, how the company makes a living), but they're valuable references none the less. My lovely girlfriend's birthday is on Sunday, and since she's so fantastic, I wanted to make her something very special. She's a big fan of Alice in Wonderland, and we were awe-struck by the incredibly well-crafted and detailed creations of AlexCF, so I combined the two. 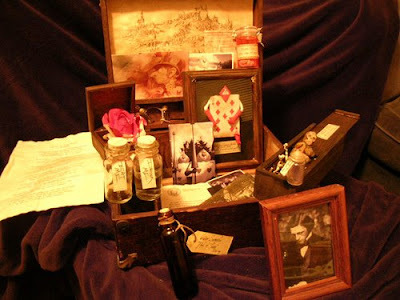 "Artifacts, Specimen, and Ephemera salvaged from the Wonderlands"
When Alice fell through the rabbit hole, she tore a rift between our two universes. Through this open rift, "nonsense" began leaking out of Wonderland. With a decreasing amount of nonsense, Wonderland became a more logical place, and since vanishing cats and singing flowers cannot exist in a logical universe, Wonderland began to die. 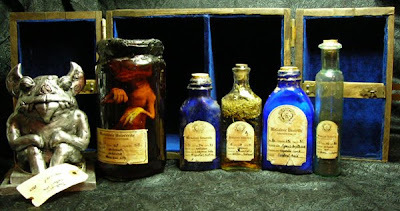 Professor Jonathan Lake, of Miskatonic University, traveled to Wonderland in attempt to catalog and archive the remaining flora and fauna so that Wonderland would not disappear into the forgotten depths of history. 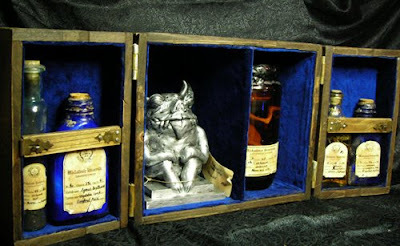 This is his collection of specimens, artifacts, and ephemera salvaged from the Wonderlands. That's my Miskatonic University seal in the background! How cool is that? The kind emailer thought I might be upset that someone used it, but my reaction was quite the opposite. I'm overjoyed that the artist made it a part of his amazing project. That's the whole intent behind making everything here available under the Creative Commons license- it's yours for the taking. If you like it, use it. Just spread da love by following the share alike rule. 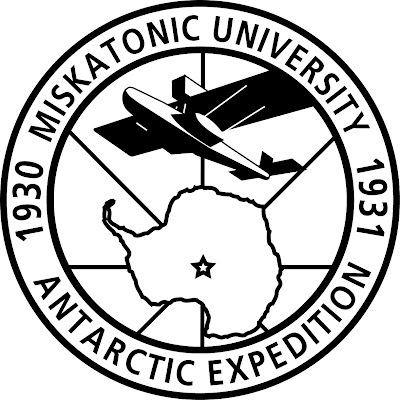 Speaking of which, I should have an improved version of the Miskatonic seal up sometime next week. The original version was bashed together in Paint Shop Pro, but now that I'm using Adobe Illustrator I'm redoing it to get rid of the pixellation when you blow it up. I can finally show a preview of the project I've been working on for the last week. This is a rough take of a photo I'm going to be adding to the ATMOM set once everything is finished. 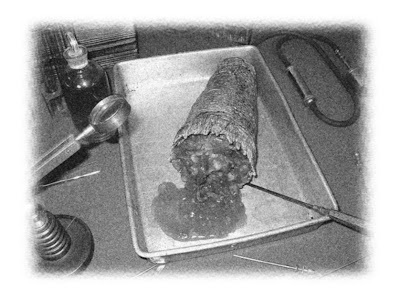 I've been using a lot of retouching techniques for the other shots, but for this one I decided I wanted to physically reproduce a conjectural picture of Lake's Elder Thing dissection. Although I'd ultimately like to tackle creating a full-scale ET down the road this particular project required a relatively small piece of the creature's anatomy. 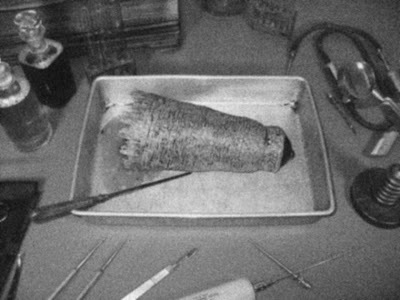 After taking the size limitations of a table-top dissection scene into consideration I decided that one of the five eye stalks would be ideal. Constructing the stalk was pretty straight forward. The foundation of the body was a fast-food drink cup while the eyeball started life as a black plastic christmas ball. After cutting away the bottom of the cup and dropping the ball into the resulting hole I used a layer of paper mache to provide the grooved, worm-skin texture of the stalk. While that was drying I drilled out the eyeball and added an iris made out of an eye from a teddy bear. 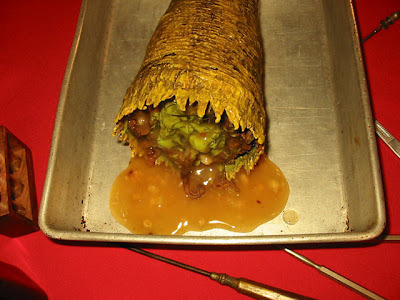 Once the paper mache "skin" was dry I stuffed the stalk with aluminum foil and gave everything a basic coat of paint before applying multiple layers of colored liquid latex to provide some depth to the skin and create the fleshy bits at the base of the stalk. This shot gives a better view of the results if you ignore the ridiculous dayglo color scheme. I just used whatever colors were handy since the final image will be in black and white . Click to view the full sized version. 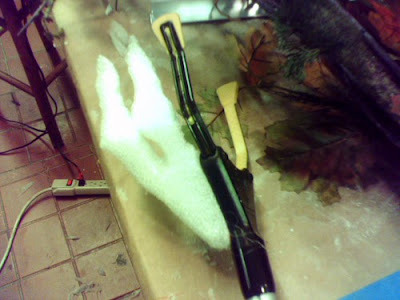 I still need to add the final weathering to the stalk, but I'm pretty happy with the results so far. A light wash of dark-colored ink followed by some drybrushing will help bring out the texture, while a few more gooey bits on the damaged end will make it look more like torn and crushed tissue. 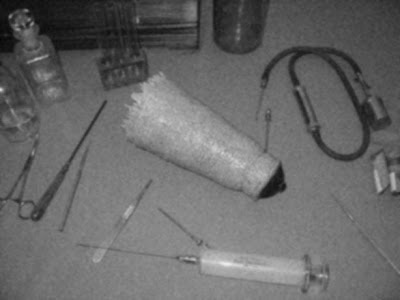 Once that's done I'll get the other props needed for the shot together, like a dissection tray and some more scientific gear. 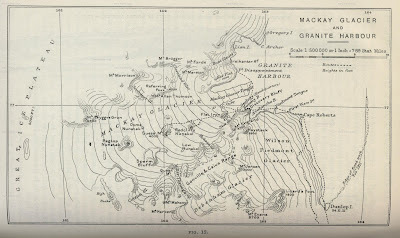 If you're running Chaosium's "Beyond the Mountains of Madness" adventure, or you're just a fan of Lovecraft's "At the Mountains of Madness" you'll find a goldmine of old maps of Antarctica at Hipkiss' scans of old Antarctica maps. They haven't been cleaned up at all, but they would make fabulous background props for anyone planning an expedition. There's good news and there's bad news on the swag front. The good news is that my order from Zazzle arrived and I was pleasantly surprised by the product quality. I've heard some horror stories about items produced by the early on-demand shops, but the resolution, fit, and finish of the Zazzle items I ordered was top notch, with one exception. The logo itself. While the logo I used look fine both here and in the Zazzle preview it looks totally different in print. Why? Because I didn't take into account the difference between how things look on a computer monitor and how they look in print or, more properly, the difference between additive and subtractive color. In print the deep blue of the logo background and the black of the Wal graphic blend into one big field of darkness, while the narrow white lines of the spars get swallowed up by the same effect. It's more pronounced in these pictures because the flash is only a foot or so away from the shirt, but it still looked horrible. Luckily, it's something I could fix once I was aware of it. I've uploaded a new logo that both lightens the background and thickens the spar lines so that the logo design will look as good in print as it does on the screen. You can see some speckling in the deep blue area caused by the ink not fully covering the image backing. Keep in mind that this was a 3XL shirt for my 6' 6" teenage son and the logo has been blown up to about 14" across. Once I saw that there was some degradation at that size I replaced the old logo image with a new one roughly 20 percent larger, pixel-wise, and shrank the proportions of the logo on the shirt about 10 percent. That should prevent any more bleed through in the future. I also wanted to mention how happy I was with the overall quality of the materials used. I absolutely hate thin, flimsy T-shirts, so I was ecstatic at the feel of the 6.1 ounce cotton used in the Zazzle shirt. It has a nice heft, and my son gave it a thumbs up for comfort. With all that said, I've deleted everything that used the old version of the logo from Zazzle and replaced it with swag using the larger, print-friendly version. If you'd like to order any of the items available, including T-Shirts, Mugs, Buttons, and Magnets, just head over here. I'm not expecting a horde of buyers, but there were enough expressions of interest that I wanted to make the tchotchkes available to anyone that wanted them. I've also left the customization options open so you can modify colors and sizes to your own specifications. Update: If the Steve from Mansfield, United Kingdom that ordered a T-Shirt before I changed the logo is reading this, please contact me. I want to make sure you're happy with it, and if you're not I'll see that it's replaced. I take customer satisfaction very seriously. 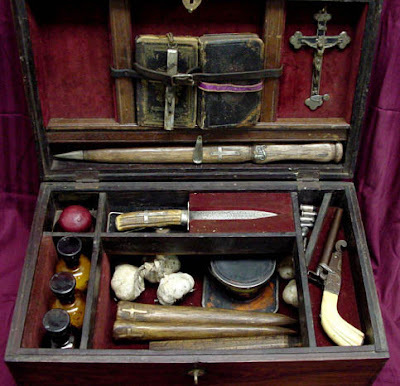 Following up on Friday's post about last week's vampire hunting kit auction, here's an entire gallery of kits collected from across the internet. 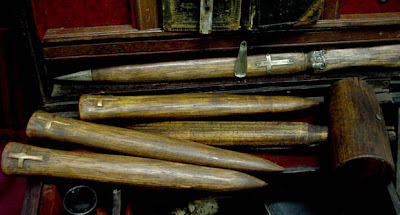 The owner of the site has some interesting information about the "Prof. Blomberg" style kits, including the results of some actual scientific testing performed on one that found it's way into a museum. Not surprisingly, it was determined to be a very convincing fake created using period materials. Personally, I find these kind of kits even more interesting because of the artistry, creativity, and craftsmanship that goes into their creation. Their authenticity is, at best, secondary to that. 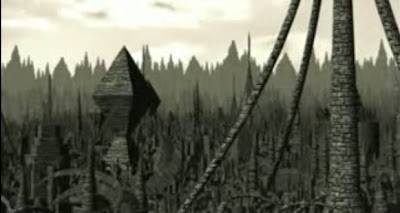 Someone in Italy, I think, has put together a pretty impressive animated version of "At the Mountains of Madness", or "Le Montagne Della Follia". You can check out the trailer, and the short, over here. I can't understand a word of it, but I like it. Has anyone else heard of it? I'd love to learn more about who was behind it. 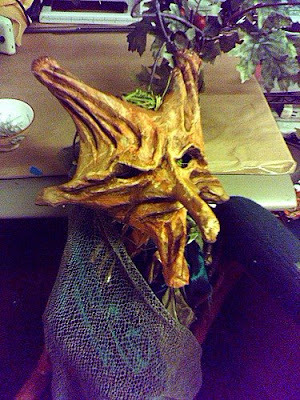 Papier-mache is one of the oldest forms for creating puppets and so a lot of people think that there must be something better out there. Actually, there are very few contenders. Done well, papier-mache is light, strong, fast, and non-toxic. I know, we’ve all had the experience of the lumpy paste, and corners that stick up and a thing that requires years of sanding to even resemble smooth. It doesn’t have to be that way. I’ll show you a technique that will only need three layers and can be danced on. To catch you up on what I spent the last several weeks building, I’m going to be posting some photos that I took during the build. The wood witch needed hands capable of picking things up. Fortunately, you can find such a thing in your local neighborhood hardware store. This trick won’t work for a lot of puppets, but the wood witch was the perfect size for using grabber arms. The usefulness of these techniques for conventional pen-and-paper gaming may be a bit questionable, but I know the LARP crowd could definitely benefit from them. It's hard to justify the rather sad "guy wearing a tie-dyed sheet" approach to the Big Bad in a live-action scenario when the creative use of paper mache and a little creativity could produce something far more memorable. 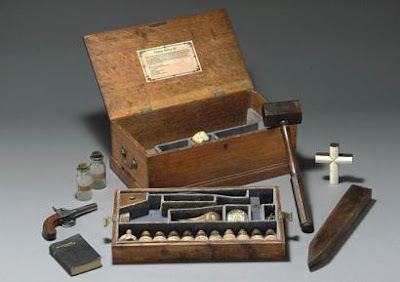 Last week an estate auction in Texas saw an "1809 Vampire Hunting Kit" sell for close to $15,000 dollars. 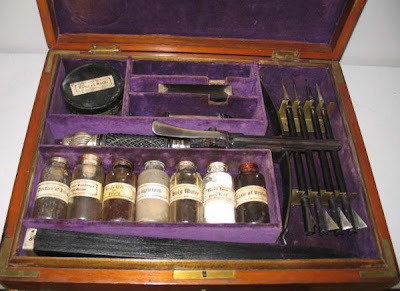 I mention it here because the kit and it's contents are an incredible example of propmaking from the past. 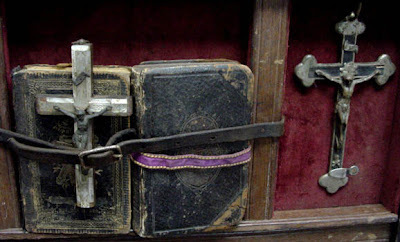 The vast majority of these items put up for sale were created in the last two decades, but there is some evidence that travellers to Eastern Europe were buying "real" kits designed for the tourist trade shortly after the publication of Bram Stoker's "Dracula". You can see more pictures of the craftsmanship involved in this one over here, but I've mirrored the pictures in case the link goes down. Now that I've had some time to think about it I wanted to write a little bit about the process of physically aging photos. If you've ever Googled the subject you're probably aware that there aren't many resources available. Because of that lack of information I was flying blind with my own efforts, other than the knowledge that most of the techniques used to age paper were probably just as useful for photos. Here are some quick thoughts on what worked and what didn't. Edge wear- I went over all the edges of the photos with fine sandpaper, paying particular attention to the corners. The result not only appeared worn and shabby, but felt that way as well. I can't overstate how important that is- for props that you're actually going to be handling the texture of the object, the way it feels in your hand, is a big part of it's immersiveness. 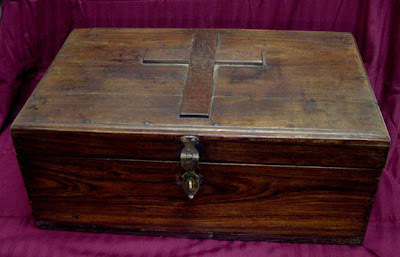 The appearance of the worn edges was considerably enhanced after I applied a staining solution to the whole photo. Surface wear- I lightly sanded both the front and back of the photo with fine sandpaper. I wasn't happy with how this turned out, since it looked like...well...someone had gone over the photo with sandpaper. The wear patterns and scratches seemed unnatural. I think the key here is to use a very fine abrasive like steel wool. Baking- After rinsing off the sanding residue from the prints with water I placed them on a cookie sheet in the oven to dry them out. The heat was set for the lowest setting, around 150 degrees Fahrenheit, and the door was left open a few inches to keep the heat from building up. 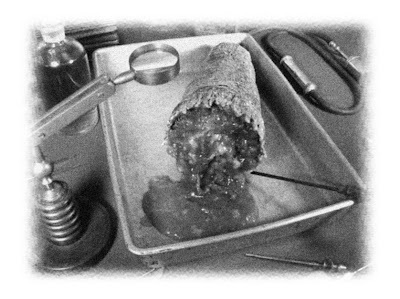 The result was a very convincing curling of the edges identical to what you find in old photos and a pleasantly aged "crinkly" feel to the paper. Age staining- I applied a weak tea solution to the entire print. The stain colored the back of the photos quite nicely, and produced a convincing darker stain along the edges, but it just wouldn't stick to the front of the prints. I think I can solve that problem by either using the aforementioned steel wool treatment or spraying a layer of matte varnish on the print before trying to stain it. I'll try both tonight and see how it works out. Update: The steel wool did the trick. The emulsion still acts as a barrier to keep the paper backing from absorbing the stain, but there's enough "tooth" to it now that the color can get into the fine crevices and produce a nice tint. The prints probably still need a coat of matte spray to make the effect permanent. 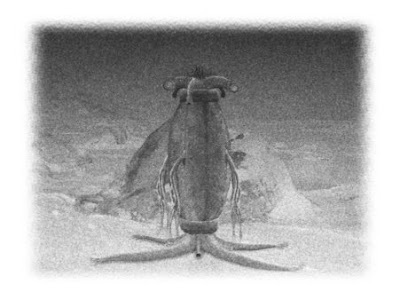 I finally finished aging the "At the Mountains of Madness" photos tonight. I apologize ahead of time for the poor photography, but it was a bear trying to avoid excessive glare from the glossy surface of the prints. 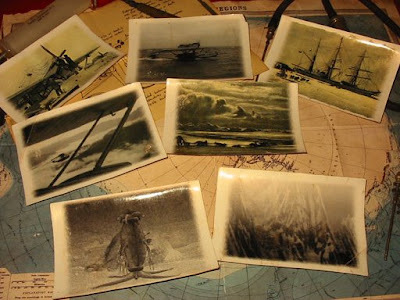 Clockwise from upper left we have workers adjusting the engine of one of the expedition's Dornier-Wal aircraft (retouched historical photo, I added a "Miskatonic Expedition" stencil to the crates in the picture), Wal undergoing testing on the water (historical photo), crews unloading the good ship "Arkham" (historical photo), dog team crossing the ice (historical photo), shot from one of the Wal camera mounts of the "strangely regular cubic structures" clinging to a mountainside (pure Photoshop), one of Lake's fossilized Elder Things posed outside the excavation entrance (pure Photoshop), and a through-the-window shot from one of the planes showing a second Wal flying in formation (historical photo). Again, clockwise from upper left we have a relaxed shot of Prof. Dyer on the Arkham (historical photo), an aft shot from one of the Wal's looking down on some low mountains (historical photo), dog team transporting part of the drilling rig (historical photo), Frank Pabodie and an assistant taking a solar fix (historical photo), and the young Mr. Danforth posing with one of the aircraft (historical photo). 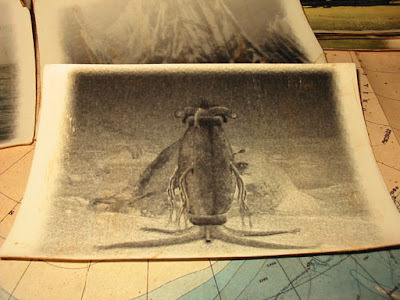 Close-up of the Elder Thing photo. This came out really well once it had undergone a little aging and distressing. A section of the Elder Thing city nestled between two towering peaks. 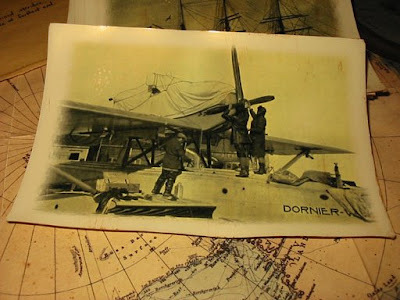 Close-up of the first Dornier photo. 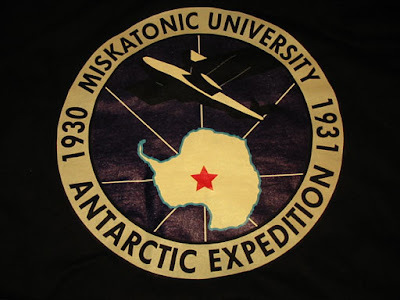 The crate sitting on the sponson has the "Miskatonic" stencil. It's subtle, but I thought it was a nice touch. Update: It looks like I'll have an independent review of the photo set by the end of the week. If my guinea pi....er....evaluator likes 'em I'll be offering them up for sale. 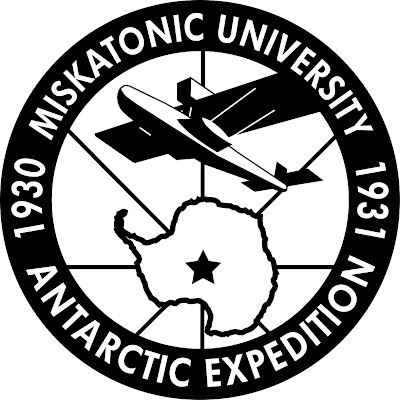 This is clip art of the Miskatonic University "Wings Over Antarctica" logo from the 1930 expedition to the Antarctic. It's released under the Creative Commons Attribution-Noncommercial-Share Alike 3.0 Unported License for your use. If you need the logo in a different format drop me an email and I'll see what I can do. I also have copies of the logo in the open-source vector .svg format, as well as .eps, and I'll post links to them as soon as I find a host. High Resolution (300 dpi). Click to view file, then save. Medium Resolution (150 dpi). Click to view file, then save. Low Resolution (72 dpi). Click to view file, then save. 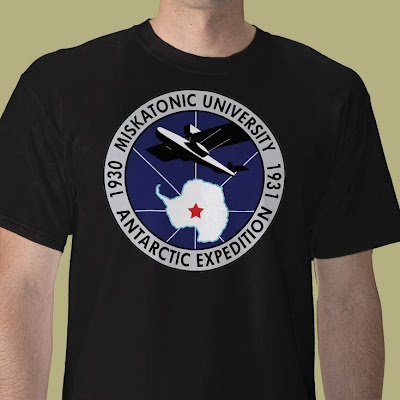 I've had a few people ask me about getting T-shirts with the Miskatonic University expedition logo, so I've set up a shop on Zazzle with the design on a few different items. I'm a little leery of the print quality offered by places that do on-demand work, so I've ordered one of everything to see for myself if the stuff is decent. If it pans out I'll put a permanent link up in the "Crass Commercialism" column. 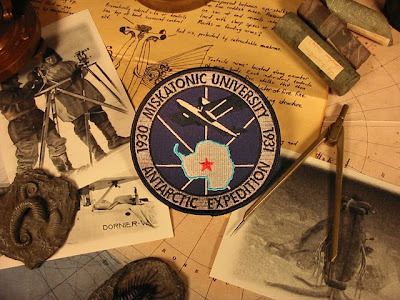 Until then you can check out the Miskatonic University Antarctic Expedition gallery over here, but I'm not going to encourage anyone to buy anything until I can see for myself if it's worth laying out your hard-earned cash. I'm really happy with how these came out. They're intended to be freebies that I can include when I mail out other stuff, but I'm going to toss a few up on Ebay just to see if there's some interest. I can put up a PayPal link up here if anyone wants some. Unfortunately, I'm once again running into the bane of my business model- shipping. Because I want everything to be as cheap as possible the charges for actually mailing them out become a huge percentage of the total cost. Postage and a mailer for one decal alone will run just under a dollar, so I'm going to price the decals at 4 for $2 so they're reasonably cost effective. I've ordered the new ATMOM patches and should have final artwork approval next Monday or Tuesday, final sewout approval by next Friday, and the patches in my hands by the week after Thanksgiving. Then I'm going to try and sell every single one of them during the first week in December. 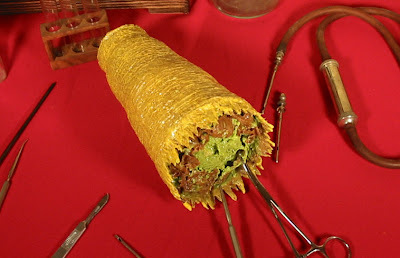 Finally, I'm going to try selling a bundle of my ATMOM props next week. 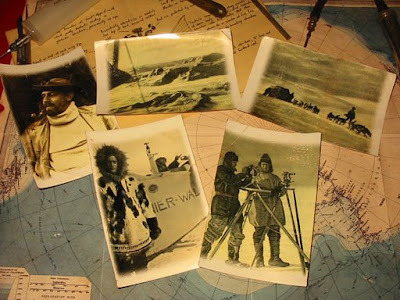 I was kinda bummed that there wasn't enough interest to support doing a print run of the Antarctica map, but I think in combination with a variety of other items the perceived value will be a lot higher. One of the nice things about my particular collecting obsession is it's flexibility. There are only a few specific items described in "At the Mountains of Madness", so I'm free to use a lot of conjectural material. 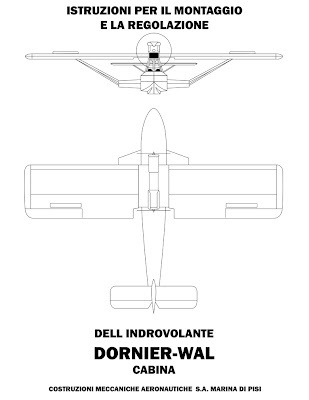 Case in point: anything related to the Dornier-Wal. Lovecraft doesn't mention the plane specifically, but the description of the expedition's aluminum hulled seaplanes matches the Wal perfectly. 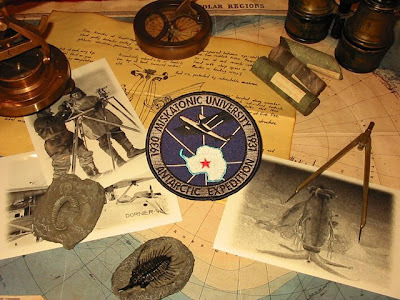 They were the aircraft Roald Amundsen used for his attempt to fly to the north pole and it's generally accepted by scholars that Lovecraft used contemporary accounts of the flight as an inspiration. That's why the Wal is featured on my patch, and it's one of the reasons I've started collecting Wal memorabilia. The others being that it's just an insanely cool example of period design as well as the perfect aircraft for all kinds of 30's era pulp adventuring. It's going to be a while before I can lay my hands on an actual owners manual, so I came up with this excerpt to tide me over. It's based on scans from the real manual produced by the Marina di Pisa factory in Italy where the plane was manufactured. Again, it's basically the same design as the original, but with a few subtle differences. I discovered that the "Frutiger" font I used in yesterday's iteration wasn't actually developed until 1975. After a little more research I replaced it with a weighted version of "Futura", which became available in 1927. 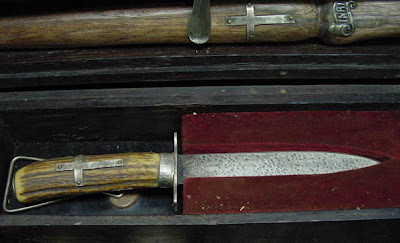 It has the same clean lines, but has the advantage of being more historically accurate. 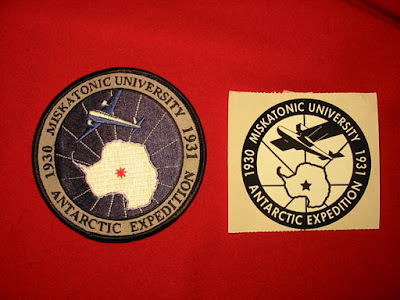 Well, as accurate as a fake expedition patch based on an almost eighty year old story about hyper-evolved starfish aliens in the Antarctic can be. I also made some small adjustments to the graphic elements of the design. The Dornier Wal is slightly larger and I tweaked it's proportions to make it stand out a bit more. The "South Pole" star is a five-pointed star instead of the six-pointed one in the original design as well as being larger and slightly rounded. Yes, that's a nod to the imagery of the story. The black and white version of the logo received even more tweaks and became a considerably better graphic in the process, in my humble opinion. The bold black outer band really stands out while also providing some needed bleed space for when it's converted into a sticker. I enlarged the Wal graphic just a smidge more and think it really pops out now. One of the side benefits of the extensive black space is that it will be easy to transfer the logo onto physical objects- just run off a photocopy with the image reversed and you'll be able to do a heat or solvent transfer onto almost anything. As always, I'd appreciate your feedback. Barring any major problems brought to my attention I'll be ordering both the new embroidered patches and a black and white decal set this week so I can have them available in time for Christmas. Update: In response to an emailed question- Yes, the designs and artwork are covered by the Creative Commons license down at the bottom of the page. You're free to grab 'em, use 'em, and abuse 'em with just a few minor restrictions you can find at the CC site. Basically it boils down to providing an attribution, releasing any derivative works under the same CC license, and not selling any products that use the artwork. You can click on the pictures above to get high-rez versions. I'll have the full vector files up by the end of the month. Update: Someone asked about my photocopy comment above. You can transfer the image from a toner-based photocopy or laser printer onto another object using either heat or a solvent. You can find tutorials on how to do it here and here. 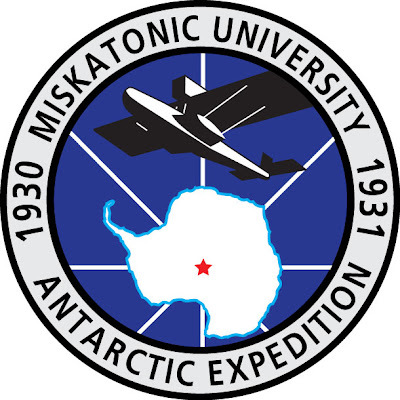 Yesterday I thought it might take me a week to have the initial redesign of the Miskatonic expedition patch finished, but thanks to my pain induced inability to sleep it's done already. It has a little more of an art deco feel thanks to the font and the stylized Dornier Wal, but it's basically the same design. I'm going to experiment with some additional elements and the color scheme to jazz it up a bit and take it in an even more deco direction. I'd also be interested in hearing any feedback or suggestions you might have via the comments below or email since I'm going to try something a little different with this design: I'm going to give it away. I still intend to make a little scratch selling items based on the design, but when it's finalized I'll release all the source files under a Creative Commons license. That way you'll be able to do anything you want with it, including remixes and mashups of the design or incorporating it into other artworks, as long as it's for non-commercial use and includes an attribution. The worst because I wrenched my shoulder on Friday and I've been in excruciating pain since then. It turned out to be a simple case of tendonitis, but even with pain killers and ice packs I've only been able to sleep for an hour or so at a time and my left arm is effectively non-functional. The best because my inability to sleep has forced me to keep busy at the computer learning the ins and outs of Adobe Photoshop and Illustrator. Up until Friday I've been producing all the graphics you see here with a ten year-old copy of Paint Shop Pro. Since then I've distracted myself from the red hot iron poker lodged in my shoulder by starting to explore what the Adobe products can do. As I mentioned yesterday, the learning curve is very steep, but I'm already getting a feel for just how powerful the programs are. Here's the first pure Adobe project I've completed: a stylized Dornier Wal aircraft for the new version of the ATMOM Miskatonic expedition patch. It still needs some tweaks, but after hearing all kinds of horror stories about how difficult Illustrator was to use I was pleasantly surprised that I was able to bang this out two days after I started learning the program. One of the recurring bits of feedback from the original patch is that folks wished the Wal replaced the rather generic aircraft featured in the original. Since this graphic is probably the most complex part of the revised patch I suspect I'll have a finished version for your perusal by the end of the week. Here's the final version of the Elder Thing snapshot, at least for now. On one hand, I really like it. It fills in a big gap in my "At the Mountains of Madness" collection and it's particularly convincing in actual print form. On the other hand, I hate it. It's one of the best photo retouching jobs I've ever done, but that's not really saying much. I became incredibly frustrated while making it because I lacked the skills and experience to make the vision in my head a reality on the screen. I know the learning process is based on making continual, incremental improvements, but I'd be a lot happier if my increments were a bit larger.